The Saracens Head Inn01600 890435work InnSeventeenth century riverside inn with eleven en-suite rooms, most overlooking the River Wye and all nonsmoking. Waterside terraces, bar, lounge and restaurant areas. Real ale, fine food. 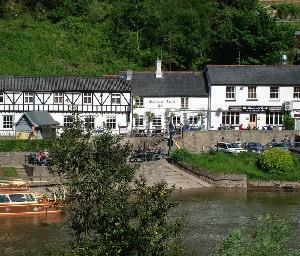 Seventeenth century riverside inn with eleven en-suite rooms, most overlooking the River Wye and all nonsmoking. Waterside terraces, bar, lounge and restaurant areas. Real ale, fine food. Leave A40 (T) at the Little Chef in between Ross and Monmouth. Follow signs for Symonds Yat East for approx. three miles. Saracens Head cannot be missed.